When I was little, every February I wondered why Valentine's-Day cards often had images of violets on them. Roses, I could understand--the flower of love makes sense. But why violets? Now that I'm a garden-owner, I know why: Violets bloom in February. Notoriously shy, the purple flowers are hard to notice at first. Often they grow heads-down, hiding underneath their broad, scalloped-edged leaves. You have to poke around a little to find them, sometimes. But, Oh! the beautiful colors! and the scent! It is both unmistakable and extremely delicate. Violets don't make very good cut flowers. They usually wilt within hours of being cut, so I've learned to enjoy them in their natural habitat. 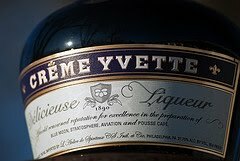 Creme Yvette is made in France of various berries and dried, crushed violets. Nana used to keep a glass carafe of it on her sideboard when I was young. I was entranced by its deep, purple color and its unmistakable smell of violets. The liqueur went out of production in the late 20th century, but happily it's back again. There aren't many places that sell it, but here's some info on where to buy it, from the manufacturer's website. For a less expensive, and easier-to-find violet fix, there's Choward's Violet Mints. I ran across them in a local paper-goods store, where I was shopping for materials to make my own Valentine's-Day cards. The candies have been around since the 1930s. I wonder if my Nana enjoyed them? For a retro, special touch to your Valentine's Day, consider adding some Creme Yvette or Chowards' Violet Mints into the mix. You'll be somebody's sweetie, for sure. Didn't know that about our Nana and Creme Yvette!